Cetacea's 9am whale watch traveled to the northwest corner of Stellwagen Bank once again, where we found lots of activity! We started with a quick swim by from a T5 humpback, Pox. We kept traveling another half mile until we reached 2 slow moving humpbacks, who luckily did a fluke up dive. It was Blackhole and Eruption. Also in the area we saw 2 other groups of humpbacks, totaling to 7 humpbacks that were close by. 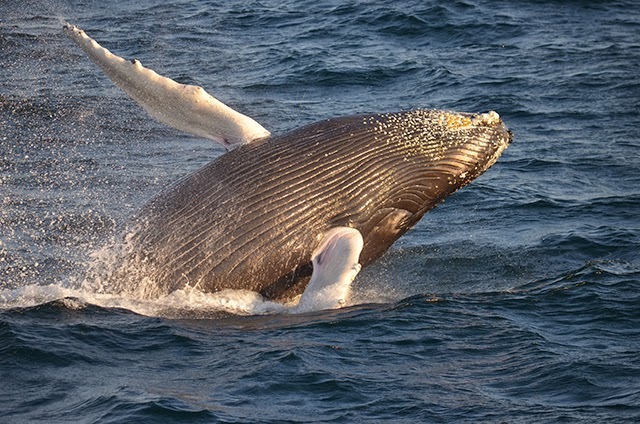 Passengers were treated to many different behaviors from these individuals, like high fluking dives, pectoral slapping, and even some breaching! Some of the IDs from the trip included; Pox, Blackhole, Eruption, Pele, Pepper, Xylem, Strike, and Buzzard. On the 1:30pm whale watch we returned to the active northwest corner. Before reaching the bank, we caught a quick glimpse of a minke whale, but it quickly disappeared. Then as we reached the bank, our second sighting was of a quick swimming finback whale. 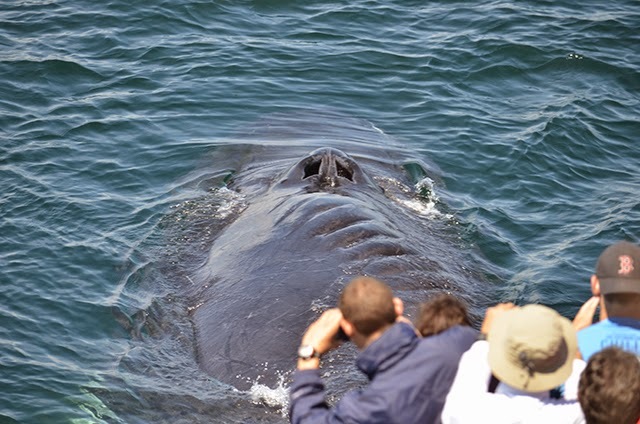 We then slowly moved up to some other whale watching boats and quickly got involved in humpback whale watching. Between the Cetacea and another whale watching boat that was about 300-400 yards away, we had 8 humpback whales. Our first group that we saw was Jabiru, Pele, and Eruption. This group was moving fast, probably to catch up to some prey. See attached photos of Jabiru and Eruption diving in unison. We also observed Pepper, Echo and her 2014 calf. The calf was being very adventurous while Mom was under the surface. At one point it even joined up with Jabiru, Pele, and Eruption before returning to Mom. It looks like the pattern is setting in well. We also saw 2 lone humpbacks that turned out to be Mayo and Xylem. All in all, it was another jam-packed trip out on Stellwagen. What an exceptional day out on the water! Aboard the Aurora, we travelled to the Northwest Corner of Stellwagen Bank National Marine Sanctuary. There were lots of recreational boats in the area, and also lots of whales! Throughout the trip, we were able to ID Eruption, Pepper, Mayo, Xylem, Pleats, Pele and Echo with her 2014 Calf! There were a few scattered groups in the area and we made our way around to most of them. We were treated to many scattered breaches throughout the trip which is always a nice surprise! Perfect place to smell Pleats' whale breath! The most exciting part of the trip was when Pleats, Echo and calf were logging alongside our boat. They continued to surface very close to us. 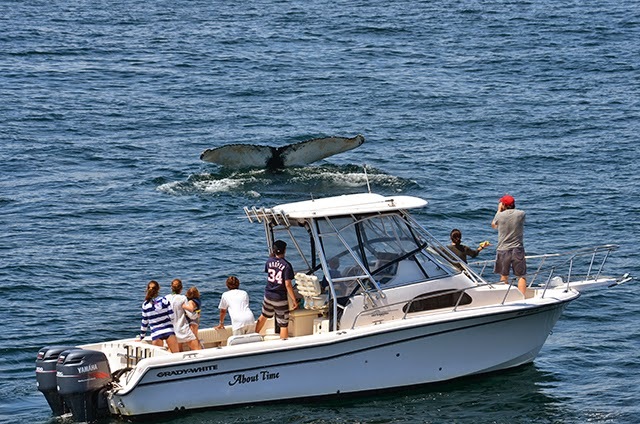 I had to laugh during my narration when I was talking about whale breath and with perfect timing and precision, these three humpbacks surfaced and exhaled some wonderful “snarge” to the folks standing in the port pulpit! 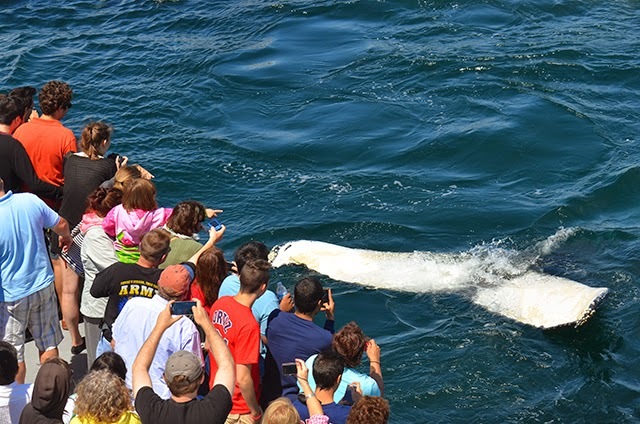 Echo’s 2014 calf was very active at the surface today! It did lots of flipper slapping and half breaches! 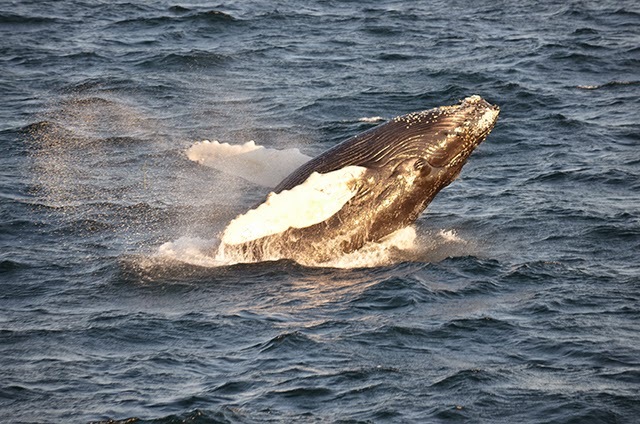 It was an awesome trip with lots of great surface-active humpbacks (definitely not something you see every day!). There were too many breaches to count this trip! Just when I thought today couldn’t be any more exciting, the 5:30 trip rolled around. As soon as we spotted blows in the distance, the breaching started…and it didn’t stop! Over and over and in almost every direction, humpbacks were jumping out of the water like nothing I have ever seen before! 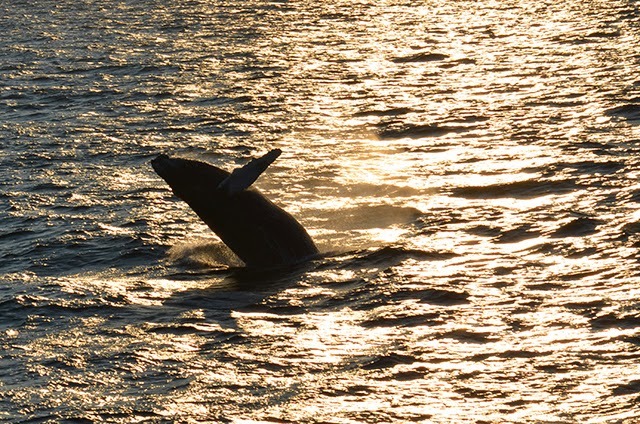 What an amazing start to a whale watch. 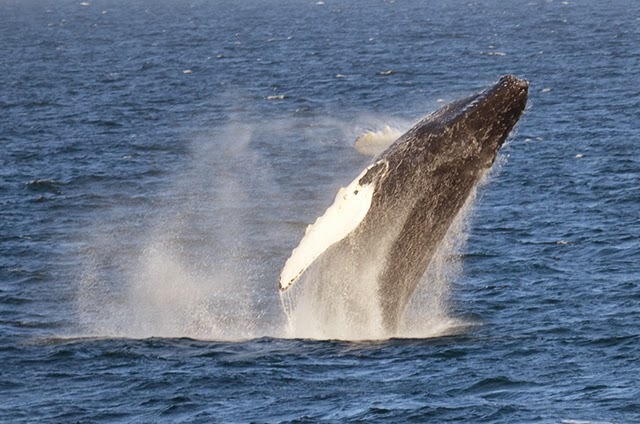 Breaching was the major behavior for most every individual we saw this evening. The breaching just didn't stop! Whenever whales weren’t breaching, they were a little shy about showing their tails which made it a bit difficult to ID some individuals. We spent most of our time with Pepper, Echo and her 2014 calf. The calf was a joy to watch throughout the trip. It even opened its mouth a few times at the surface as though it was practicing feeding. The mom and calf pair even did some tail breaching together. It was unbelievable how many breaches we saw! Some passengers suggested that it might be caused by the super moon that’s happening tonight. No matter the cause, the sight was nothing short of spectacular! Everyone on board, myself included, will remember this day for years to come.